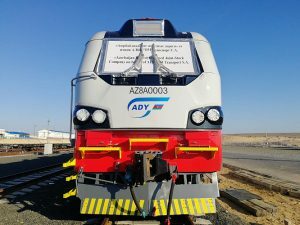 Kazakhstan Railways announced that it has delivered another AZ8A electric locomotive to Azerbaijan Railways (ADY). The locomotive traveled 2,500 kilometers by rail to the Kuryk Port station and then was shipped to Mercury ferry and delivered to the Baku International Sea Trade Port (Alat Port), via the Caspian Sea. The locomotive was assembled at Electrovoz Kurastyru Zauyty (EKZ) plant in Astana, that operates under a joint venture between Alstom and Transmashholding. The AZ8A is a Prima T8 heavy freight locomotive developed for Azerbaijan. It is based on the KZ8A locomotives currently in service in Kazakhstan and ADYs specific technical requirements and is compliant with GOST standards and specifications. With its eight axles, Prima T8 is one of the most powerful electric locomotives in the world. This model is a two-section freight locomotive capable of towing up to 9,000 tonnes and running at 120 km/h, with installed continuous power of 8.8 Megawatts. The AZ8A is designed to operate in temperatures ranging from -25°C to 50°C. It requires minimum maintenance and provides high reliability levels and low lifecycle costs thanks to its modular design. The first AZ8A locomotive was delivered in December. In June 2018, the first Prima T8 AZ8A electric freight locomotive for Azerbaijan Railways was presented. The first AZ8A forms part of a 2014 contract awarded to EKZ by ADY for a total 50 locomotives, including ten Prima M4 AZ4A passenger locomotives. EKZ employs 420 people and is working on supplying and maintaining the Prima electric locomotives ordered by KTZ for 2020. In 2017, EKZ became the first train manufacturer in Kazakhstan to receive the IRIS certification (International Railway Industry Standard).